How does one follow an acclaimed debut album that was built from the rubble of tragedies, namely demise of a previous band and a death in the family? With a self titled album and a change of atmosphere, that’s how. 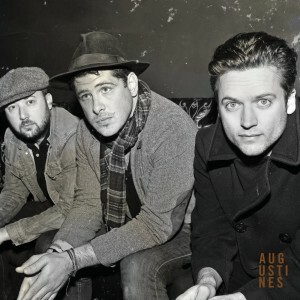 Augustines (heretofore known as We Are Augustines) moved their Brooklyn camp to Seattle and recorded with producer Peter Katis (The National, Jonsi, Frightened Rabbit) at his Tarquin studios in Bridgeport, Connecticut. We believe you, as the first single, “Cruel City” should be played at the Olympics and will make you dance and sing along in hope. “Hold Onto Anything”, is the summer’s rock anthem that channels Bruce Springsteen in all the best ways. Immediately preceding this is “Highway 1 Interlude” a joyous and graceful instrumental piece. This expansive sound the Augustines have crafted on this second go round chronicle hope and are just as intimate as their chronicle of despair that we loved. This album will stay on the Nest’s playlist for quite a while.